Follow the the dust trail through the cosmic canyons and find Doobie Fontaine, filling the space somewhere between the surfier end of Neil Young’s repertoire, the melancholia of Gene Clark, but with the urgency of 13th Floor Elevators. London 5-piece Damsen create a spacious world where hazy vocals soar across downtempo rhythms and sleek guitar riffs. Taking cues from the dark allure of Portishead and the laid-back feel of Little Dragon, Damsen craft a sound that is both ethereal and hypnotic. 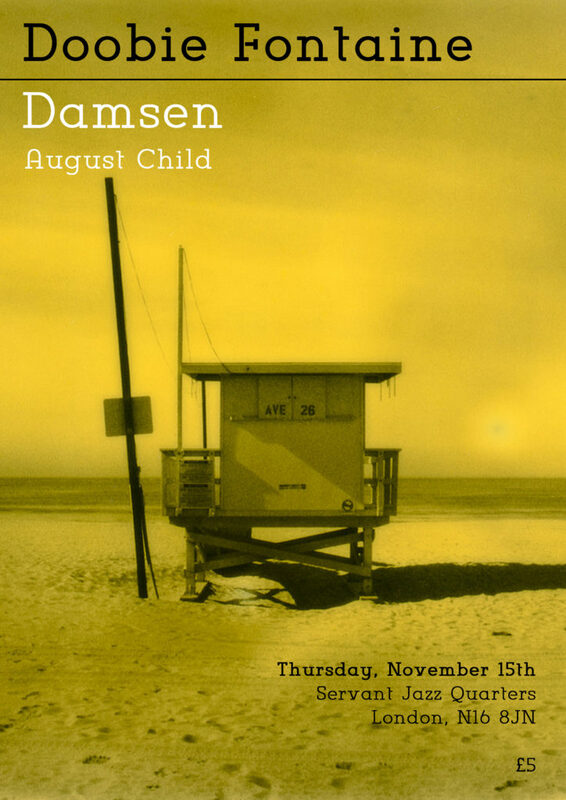 August Child is an alternative singer-songwriter based in East London, whose music unveils the workings of a dark mind in a vibrant city. Influenced by the likes of Ben Howard, Angel Olsen and Damien Rice, the guitarist has developed a unique and melancholic aesthetic, with lyrics to match. This was captured on his 2018 EP ‘Burn For The Tide’, released on Fierce Panda Records and described as ‘a wonderfully crafted and touching body of work, which is not only captivating and authentic, but also addresses the weight of living in a powerful yet vulnerable way’.